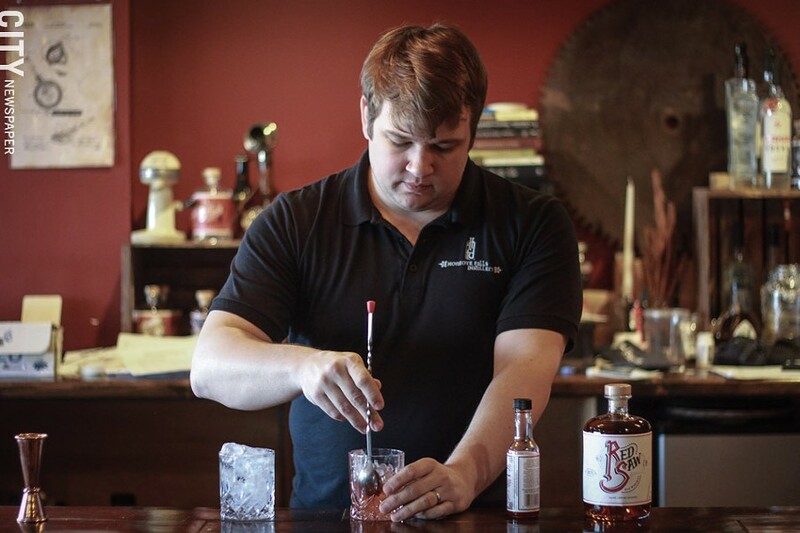 PHOTO BY KEVIN FULLER Co-owner and Head Distiller Teal Schlegel mixes a Sazerac with Honeoye Falls Distillery rye whiskey. Tasting room hours: Wednesday and Thursday, 4 p.m. to 11 p.m.; Friday and Saturday, 3 p.m. to 11 p.m.; Sunday, 10 a.m. to 3 p.m.
Teal Schlegel, head distiller at Honeoye Falls Distillery, is a bit of a chemistry nerd. But despite all my questions about the distilling process, it's clear that Schlegel wants to focus on the craft rather than fixating solely on the science. "It's funny that you latch onto my obsession with the technicals of it," Schlegel says, "but it ultimately comes down to someone sitting here, at the parrot, at the condenser, tasting the spirit coming from it. That's the art, right? That's where it comes from. That's the house flavor, so to speak." A Pittsford native and SUNY Brockport alumnus, Schlegel realized he had a passion for craft liquors — and in particular, whiskey — by accident in 2007. While on a trip to Taiwan, Schlegel's wife ordered a whiskey and ginger ale. Perhaps through miscommunication, or divine providence, her waiter brought a Macallan 18-year-old Scotch to the table. One $400 bottle service later, the Scotch found its way home to Teal. The taste was a revelation for him. "It really kind of piqued my enthusiasm," Schlegel says. "And over the next couple years, I went pretty crazy for whiskey and kind of treated it as a hobby of sorts, trying to find the next best whiskey." Schlegel and his business partner, Scott Stanton, started Honeoye Falls Distillery in 2014. Today, the distillery offers patrons its own whiskey, gin, vodka, and absinthe in its tasting room; for $8, you can try any three liquors in quarter-ounce samples. The spirits have names like Devil's Bathtub Gin, Red Saw Whiskey, and Frozen Falls Vodka, in tribute to Honeoye Falls' landmarks and natural attractions. Honeoye Falls Distillery has a Class D distiller's license, also known as a farm distillery license, meaning that, under New York's 2007 Farm Distillery Act, 75 percent of the ingredients used in the beverages must be sourced in state in order for the distillery to make and sell its products on site. Often Schlegel doesn't have to look far for the right ingredients. The distillery gets its grain from Dave Meisenzahl's farm right in town, and Pioneer Malting on Paul Road in Rochester provides the barley. "Luckily we're surrounded by a lot of great resources and great farms," Schlegel says. "We proudly say that we're 99 percent Monroe County-sourced for all of our spirits ... all this grain comes in from our local farmer. The field across the street is going to grow our winter wheat." Having a variety of wheat is ideal for the distillery's Zamir Vodka (40 percent ABV), resulting in a mellower taste without a harsh kick. The spirit is a collaboration with Zamir Gotta, a frequent traveling partner of Anthony Bourdain. 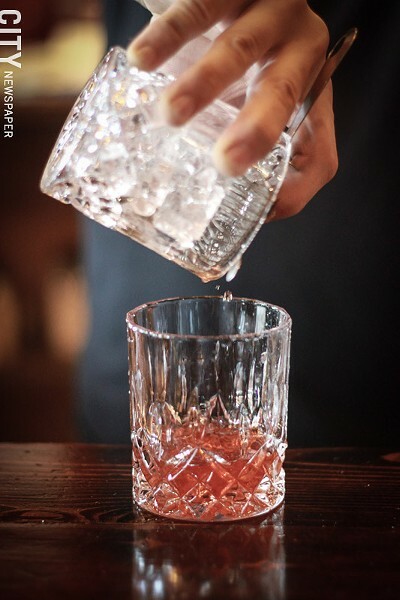 The distillery's other vodka, Frozen Falls (also 40 percent ABV) — which won the American Distilling Institute's 2016 award for Best Grain-to-Glass Rye Vodka — delivers a spicier kick that dances on the tongue. The distillery's two whiskeys offer a similar choice between soft subtlety and bolder zest. The Red Saw Rye Whiskey (48 percent ABV) is a satisfying liquor characterized by lingering sweetness and a slight spice that decays quickly. The Red Saw Bourbon Whiskey (also 48 percent), on the other hand, is hot on the tongue and has a smokiness that sneaks up on you. As for the cocktails, "That Old Fashioned" ($9) breaks the mold right from the get-go: the drink is made with gin rather than whiskey. While this may seem like the height of sacrilege on its face, the Devil's Bathtub Barrel Rested Gin is stored in whiskey barrels, imbuing the gin with an appealing combination of sweetness and smokiness. The end result is decidedly drier than a traditional Old Fashioned, but the fruit and sugar help to temper the bite of the alcohol. Add aged orange bitters and Peychaud's bitters, and you've got an attractive twist on an old favorite. Honeoye Falls Distillery also has a full yet concise food menu of pub fare with sophisticated, locally sourced ingredients. There are daily specials, and menu items change frequently. The distillery's Chef and Head Cocktail Artist Celia Cleary has focused her energies on elegant but uncomplicated recipes using ingredients that bridge the gap between comfort and sophistication. Look out for the HFD Burger, an excellent, savory counterpart to the spirits on the menu. Cooked to a medium rare, the burger also includes bacon, pimento cheese, and a house sauce ($11, served with fries or slaw). Schlegel, for his part, is a perfectionist. This may be why he offered me the pleasant La Cascade Verte absinthe (70 percent ABV), but was hesitant to serve La Cascade Rouge, explaining that it was an experiment that wasn't quite ready. "When you come back, it's our job to show you we've grown, we've evolved."